When a young vampire hunter is saved by one of those he is sworn to destroy, he is forced to question everything he was taught. He soon learns that there is far more to vampires - and to the conflict he was born into - than he ever realised, and he finds himself siding with sworn enemies to pursue their cause. Read, in his own words, the story that altered his life as he recounts the night of his salvation and his entry into the hell that followed. I will start this review with a confession: I don't seek out vampire novels. 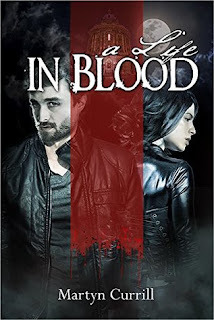 So when a writer guaranteed to wow me with amazing and original work and can make this grown woman fan-girl with a single post shared A Life in Blood by Martyn Currill, I'm not sure if I eeped or clicked first. The end result put this book in by hands, blurb unread. Diemos Black, vampire hunter, finds himself healing at the hands of the very creatures his family has hunted down and destroyed for centuries. I loved his voice as narrator. He is smooth, observant and capable of bluntness when called for. We aren't spared his pain nor his victories. His consistent way of telling reliably cements the many aspects of A Life in Blood together. I found out quite quickly that vampires and Currill's vampire lore are only a part of this story and the characters. Just as gender, age, experiences or appearance put a character together, being a vampire only describes each character only in part. I appreciated A Life in Blood as a British military action story first. It sets great characters on a solid foundation of hunter/vampire family history and couples the whole thing with exciting combat scenes, military tech and genuine relationships then finishes it off with enough flash and bang to leave me catching my breath at the end. A Life in Blood is a solid military-fantasy (that's my word for it) that confidently marks all the X's in blood.